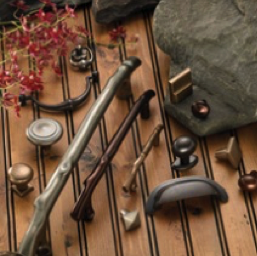 Cabinet hardware and pulls are like accessories, they are personal, show off our personality and can change the look and feel to any cabinet. Re-staining, painting or changing the cabinet facing can make a big difference to your kitchen upgrade but it isn’t complete without the perfect hardware. When choosing the hardware, you want something that will complement the finish of the cabinets. If you have cloned oak for cabinets you don’t want to add a dark hardware you want something sleep and modern such as brushed nickel. If you are looking for something different Top Knobs offers knobs and pulls that are rustic, unique, sleek and modern. You don’t have to spend a fortune on knobs and pulls you just have to buy what you like and what will work on your space. Take a picture of the cabinets to get the right finish then take a sample home, test it out, attach it to the cabinet and step back. Is this the right look? Can you live with this for years to come? Does it tie in with the paint, flooring and faucets already in place? If you like a little flash then Top Knobs has it. Top Knobs offer crystal knobs that give you the flash and sparkle you crave, they work well with any hardware finish. The best thing about it is you can mix and match, add the crystal knobs for the drawers and handles for the cabinets to create a wonderful eclectic feel to the room. Don’t be afraid to be creative and artistic with your hardware, if you want to tie it all in choose a spot to make it a focal point and add a mosaic tile feature. You can do this with an antique picture frame, old tile broken into pieces, a piece of drywall and a design. Lay out the design on the drywall, glue the pieces of tile to it in the design created, once dry grout, seal and place into the frame. You can proudly display this work of art in your kitchen.